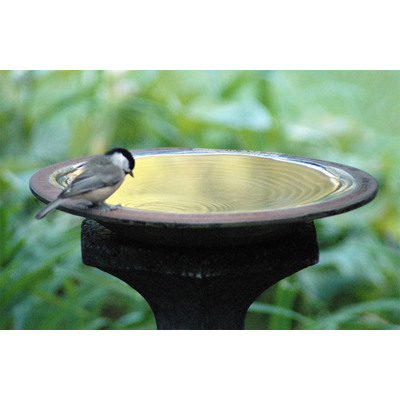 Our birds vote this their favorite for drinking and bathing. That's because it's so easy for us to empty and refill with cool, fresh water every day in the hot summer months. Unglazed rim for secure perching, with a verse by William Blake. Glazed bath is easy to clean - and stepped, so it's not too deep for small birds. Protect from freezing. 13 1/4" diameter x 1 1/2" deep. Use with your own base or pedestal.